The Big Dipper, photographed by Miguel Claro in the Canary Islands in September 2013. Probably the most prominent and most famous of all the star patterns now hangs high in the north in the evening sky — the seven stars that we in the United States refer to as the Big Dipper, and people in the United Kingdom call "The Plough." A widespread tradition held that these stars represent a "wain," or farm wagon, so the British also knew it either as Arthur's Wain (for King Arthur) or Charles' Wain (for Charlemagne). May is the best month to see the Dipper, as it is now visible practically the world over. Only those living south of the Tropic of Capricorn (23.5 degrees south latitude) will have a hard time spotting the star pattern. When I journeyed to Easter Island in 1986 to view Halley's Comet, I found the Big Dippera most arresting sight, literally skimming just above the northern horizon. There it appeared upside down and seemingly enlarged, thanks to the "moon illusion" effect. 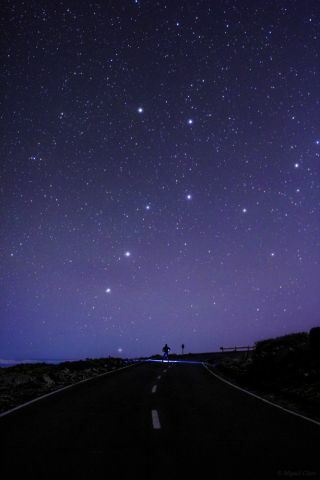 Only below 40 degrees south latitude — at the bottom of South America, the South Island of New Zealand and Tasmania, for example — are none of the Dipper's stars ever visible. The moon illusion refers to the fact that Earth's nearest neighbor appears abnormally large when it's either rising or setting; when it's higher up in the sky, it looks noticeably smaller. Using the Big Dipper, you can observe another type of moon illusion: Look at Dubhe and Merak, the so-called "Pointer Stars" at the end of the Dipper's bowl, and try to imagine 11 full moons lined up in the space between them. Bright things in the sky look bigger than they really are. Artists seem to know this, whether consciously or not, and tend to exaggerate the moon's size drastically in their paintings. Try taking a photograph of the moon with a normal 50-mm camera lens and you'll see what I mean; the object appears surprisingly small. Interestingly, when the first Zeiss planetarium projectors were built in the 1920s, both the sun and moon were designed to subtend exactly 0.5 degrees when projected on their hemispherical screens, commonly called a dome. But to the eye they appeared much too small compared with the actual sun and moon. So Zeiss technicians ended up doubling their size to make them appear more realistic, a practice that continues to this day. Finally, let's talk about the current evening apparition of Venus, which reaches a pinnacle of sorts this month. I usually leave my workplace for home shortly after 10:30 p.m., and it has been fantastically odd to have Venus accompany me on my drive home. It's been odd because, usually, Venus has long since set by the time I head home. At sundown nowadays, Venus literally soars, appearing about halfway up in the sky between the horizon and the point directly overhead. In fact, for a few days centered on May 23, Venus will be setting about as late into the evening as it can get. Some astronomy guidebooks tell you that you can neversee Venus around midnight. And yet, thanks to Daylight Saving Time, Venus will be setting at 11:45 p.m. EDT as seen from New York, while for places that are just east of the boundary line of a specific time zone, Venus appears to set well after midnight. Examples include Salt Lake City (12:16 a.m. MDT), Indianapolis (12:30 a.m. EDT), and Pierre, South Dakota (12:44 a.m. CDT). Venus will reach greatest elongation (angular separation) from the sun on June 8 — but by then its altitude in twilight will already be decreasing as seen from mid-northern latitudes. The causes are the changing tilt relative to the horizon of the ecliptic (that line in the sky that marks the orbital plane of the Earth around the sun) and the fact that Venus attained its farthest north declination (26 degrees) on May 10. Since that date, Venus has been shifting southward, but the sun continues northward until the June solstice.